It’s not surprising that osteoporosis has been found to be a risk factor for progression in adults with scoliosis, so it should also stand to reason that similar bone mineral deficiency can lead to scoliosis progression in adolescents. The study entitled Osteopenia: A New Prognostic Factor of Curve Progression In Adolescent Idiopathic Scoliosis showed that adolescent girls with scoliosis were at greater risk for progression when they concurrently had osteopenia. Osteopenia is the thinning of bone mass and is often considered the precursor to the more severe condition of osteoporosis that usually occurs later in life. 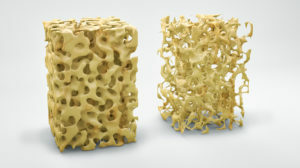 Osteoporosis aka “Fragile Bone Disease” is characterized by a loss of bone mass caused by a deficiency in calcium, vitamin D, magnesium and other vitamins and minerals and is usually only thought to problem associated with menopause. In this study researchers evaluated the bone mineral density (BMD) in the spine and hips of 324 adolescent girls with scoliosis. What they found was a correlation between a diminished BMD in girls with scoliosis to an increased likelihood of progression of their curvatures. The suggestion that diminished bone mineral density is a risk factor for progression of a scoliosis also does not come as a surprise. What was surprising was the high percentage of adolescents with scoliosis that were also found to have osteopenia. Researchers estimated that as many 38% of young girls with scoliosis also have osteopenia, putting patients in this group at a significantly increased risk for curvature progression! What they found was that over time the group that had progression of their curves also had a greater loss in bone density. Thus the evidence is clear that lower bone mineral density is a risk factor for progression. As a result, doctors with Scoliosis Systems now recommend a Bone Density test (DEXA or DXA Scan) and a blood test for Vitamin D and Calcium Deficiencies to rule out this important risk factor for scoliosis progression in Adolescence. The results can be important in making dietary and supplement recommendations for those showing signs of osteopenia. The authors also identified other risk factors for scoliosis progression which included a delayed onset of the menses. The research shows Ammenorhea and scoliosis progression are linked. The findings from both studies confirm hormones and bone health are directly related. Estrogen and Testosterone must be in balance for the menses to occur and continue regularly. Researchers routinely find testosterone to be in high concentrations in scoliosis adolescents, which leads to the interruption of the menses and the normal bone density. Scoliosis tends to progress the greatest during the times of the increased metabolic activity such as the major growth spurt that occurs at the onset of puberty, also during pregnancy and menopause. Weight bearing activity improves bone density, however this proves less effective in scoliosis patients. One reason this may be true is due to the asymmetrical loading to the bones in scoliosis curvatures. This entry was posted in Scoliosis on May 16, 2017 by Marc Lamantia D.C..